In this part of the Home Lab Build series, we’ll step through the creation of a Windows 2012 R2 Domain Controller. While one of the more basic installs, it can carry some fairly important tasks within a lab environment. You can find the visio file for the diagram is here. If you want a basic set up with some kind of identity source, name resolution and a time sync source all in one, building a Windows AD box is going to be on your short list. Also, if you plan on studying for a Microsoft or VMware certification, having a grasp on Active Directory is a must. Like it or loath it, Windows and in turn Active Directory dominates many corporate networks today. So let’s get to it. First up, using the vSphere Desktop Client, create a VM with a Guest OS of Windows Server 2012 (64-bit). Change the NIC from E1000E to VMXNET3 and leave all other “Create New Virtual Machine” wizard settings to their defaults. Using Thin provisioning is a good idea in a lab environment especially if you’re disk space constrained. If you have more than 2 physical cores on your ESXi hosts, change the vCPU count of your VM to 2 but don’t do this if you lab only has 2 physical cores. Mount the Windows 2012 R2 ISO to this VM and then power it on. Once the Windows installer is booted, select the appropriate language and click the “install now” button. Setup will give you a choice for the OS version, in this case, we want the standard GUI installation. On the following screen you’ll be asked if you want to “upgrade” an installation or “custom” which actually means “install windows only”. Select “custom” and then use the whole disk without creating any partitions by just clicking “next”. The installation of the OS will now commence and will take a few minutes (depending on your hardware). After the install is complete and the server reboots you will be asked to set an Administrator password. Once logged in to the server, VMware Tools is the first thing that should be installed. This will provide the drivers and utilities needed to get the most out of this VM. Specifically, without VMware Tools, the VMXNET3 network card we chose to use does not have default drivers in Windows. Reboot the server once the VMware Tools installation is complete. The server can now have it’s network identity created. We’ll set a static IP, a subnet mask, a gateway and a name (DNS) server. We’re actually going to set the DNS server to the localhost IP because this server will have the DNS services running on it. Finally we’ll set a hostname turn off the local firewall and then reboot once again. After the server is on the network with the correct details, we will enable the ability to remotely manage it with a Remote Desktop Client and then add the “Active Directory Domain Services” and “DNS Server” roles. As we step through this wizard we will create a new forest with the domain name of “labguides.local” and configure a Directory Services Restore Mode password. If you need more information, watch the video for a detailed guide on how to accomplish these tasks. As part of documenting my home lab (re)build, today I’m going to build an ESXi 6 server and then bootstrap VSAN using a single hosts’s local disks. 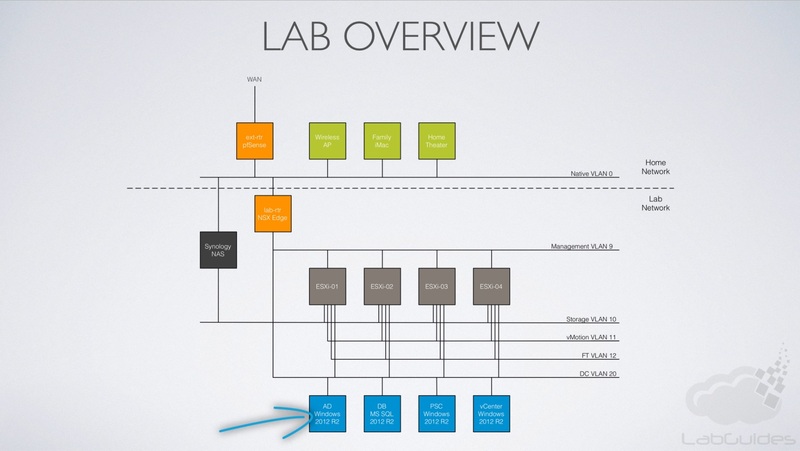 If you’re following along my Home Lab Re-Build series, we’re building the first ESXi host in the diagram. So why ESXi6? Well, we want to host some VMs, we want to use just local storage but we want it to be stable and have the ability to run nested ESXi VMs on top. Using VMware Virtual SAN on a single host provides no data redundancy so you’ll want to keep that in mind if you’re deciding to go this route. It’s a configuration not supported, but (in my opinion) really useful in a home lab environment. First off we’ll wipe the local disks, then we’ll install ESXi 6, set a root P/W and set the management network up. Once it’s on the network we’ll install the vSphere Desktop Client and configure NTP and SSH. Finally we’ll configure VSAN to use the local disks of this single host. So, let’s get into it. We’re going to mount the Gnome Partition Editor ISO to give us the ability to wipe the local disks of any existing partition information. This is required when configuring VSAN as it expects blank disks. Once Gparted is loaded we can select each disk and then ensure no existing partitions exist. In the video below I forgot that we need to create a blank partition table prior to rebooting the hosts at first. Create a new partition table by selecting the Device -> Create Partition Table, leave the table type as “msdos” and click apply. You’ll need to repeat this task for each disk to be used by VSAN. Once the disks have a blank partition table you can install ESXi 6 as normal, I wont document that here as it’s a fairly basic process and included in the video below. Once ESXi is installed, set the management network and install the new version of the vSphere Desktop Client (browse to the IP of you ESXi host for details). We need SSH / CLI access to be able to bootstrap VSAN so enable SSH in the vSphere Desktop Client by going to Configuration -> Security Profile -> Services Properties -> SSH -> Options -> Start. I first heard about enabling VSAN on a single host from William Lam’s post. He’s using it to get vCenter up and running without the need for shared storage so we’re using is slightly differently but he concept is the same. He’s also got a post on using USB disks in VSAN. esxcli vsan policy setdefault -c cluster -p "((\"hostFailuresToTolerate\" i1) (\"forceProvisioning\" i1))"
esxcli vsan policy setdefault -c vmnamespace -p "((\"hostFailuresToTolerate\" i1) (\"forceProvisioning\" i1))"
esxcli vsan policy setdefault -c vdisk -p "((\"hostFailuresToTolerate\" i1) (\"forceProvisioning\" i1))"
You’ll now have a new VSAN datastore mounted on the local ESXi host. Remember, this datastore is not redundant so use caution. Next in the series we’ll go through building a AD controller to be used for the lab DNS, NTP and Directory Services. I have 2 primary systems in my home lab that are identical and based on the E5-1620 Xeon chip from Intel. While they have plenty of power for what I need (they are a quad core, 3.6 Ghz CPI), the they do use a considerable amount of power being rated at 130 watts. The CPUs are coupled with 64GB RAM per system, which is probably the biggest limit in my lab today. The ram is a little older and none-ECC. While it was ok when I first got these systems a couple of years ago, it needs replacing. I use the SuperMicro X9SRH-7TF motherboard which supports up to 512GB if you get the right type. For me, this board provided me with 2 great things. First, lots of memory support. Secondly, onboard 10GbE ports. I hook both of these systems together with the cheapest 10GbE switch I can find the Netgear XS708E. It’s not fancy, but it pushes packets over copper fast. The systems are housed in the super quiet and minimalist Fractal R4 case. Lets move onto the layout of the lab I’m going to (re)build. I’ve quickly drawn up how my home network is set up today and how I’m going to connect that through to my home lab, probably using an NSX or vShield edge. You can see I have 4 ESXi hosts, along with the 2 Supermicro based systems, I also have 2 small HP N36L Microservers. I don’t have a use for them at this stage, but I’m sure I can find something along the way. Storage is both local in the form of VSAN on the ESXi systems and network based on a Synology NAS. In the lower portion of the diagram you can see the 4 VMs that I’m going to build first. An AD box, a database server and then vCenter with an external PSC. As we go along I’ll add to this diagram anything I decide to include. And if you have any comments or questions please reach out.